The government paid former UK Attorney General and member of the House of Lords, Baroness Patricia Scotland, £50,000 (MVR1.25 million) in excess of an agreed fee for legal advice concerning the Maldives’ suspension from the Commonwealth Ministerial Action Group (CMAG), the 2012 audit report of the Attorney General’s Office (AGO) has revealed. The audit report (Dhivehi) made public yesterday (June 11) revealed that a terms of reference (ToR) to hire an unnamed foreign legal expert was signed by the AGO on May 28, 2012, after the Maldives was suspended from CMAG – the Commonwealth’s human rights and democracy arm – and placed on its formal agenda following former President Mohamed Nasheed’s allegation that he resigned “under duress” on February 7, 2012 amid a violent mutiny by sections of the police and military. Auditors discovered that the legal expert – revealed in the media at the time to be Baroness Scotland – was paid £50,000 without signing a formal agreement in addition to a consultancy fee of £75,000 (MVR 1.81 million) agreed upon in the ToR. Section 8.22 stipulates that consultancy work needs to assigned on the basis of a contract with specific terms mutually agreed upon. Auditor General Niyaz Ibrahim therefore recommended legal action against the responsible officials as the excess amount was paid in violation of article 47(b) of the Public Finance Act. The audit report also noted that the AGO spent MVR108,902 (US$7,062) on plane tickets and accommodation for Baroness Scotland and her assistant for a visit to the Maldives, despite the lack of provisions for the expenses in the ToR. The Auditor General’s Office recommended that such expenses for amenities along with fees for any additional work should be stated in the contract. The report also revealed that the AGO spent MVR 16.9 million (US$1 million) in excess of the annual budget for the office approved by parliament. A total of MVR 16.3 million was spent with approval from the finance ministry for consultancy work by foreign legal experts, the report noted. The Auditor General’s Office contended that the expenditure in excess of the approved budget was in violation of article 96(c) of the constitution, the Public Finance Act, and public finance regulations. Among the cases for which the AGO sought foreign legal assistance were the termination of a concession agreement with Indian infrastructure giant GMR to develop the international airport, disputes concerning a border control agreement with Malaysian firm Nexbis and payments owed for the “Maldives Asset Tracing, Recovery and Repatriation Engagement” investigation launched in 2010 by the now-dissolved Presidential Commission. The audit report revealed that a ToR was signed with a Singaporean law firm on March 1, 2012 for legal assistance concerning the contract disputes involving GMR and Nexbis. Following the cancellation of the concession agreement with GMR, the law firm was retained under a second ToR for the arbitration process currently ongoing in Singapore. The audit found that neither the fee nor expenses for the lawyers were stipulated in the ToR as required under section 8.22 of the public finance regulations. Instead, the Singaporean law firm was to bill the AGO for its services at a price of its choosing, the report stated. The AGO paid the firm a total of MVR 7.1 million (US$460,440) in 2012 for legal assistance and other expenses. A British lawyer was also hired in November 2012 until the conclusion of the arbitration process involving the GMR contract without signing an agreement stipulating the price as required by the public finance regulations. 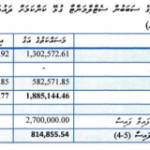 The AGO paid the lawyer MVR 1.2 million (US$77,821) in 2012. The Auditor General recommended legal action against the responsible officials at the AGO in accordance with article 48 of the Public Finance Act. Among other cases flagged in the audit report as ostensible violations of public finance law, auditors discovered that the AGO spent MVR 76,810 (US$4,981) for purchases and services without approval from senior officials as required by section 8.05 of the public finance regulations. Moreover, the AGO bought airplane tickets worth MVR 45,994 (US$2,982) without seeking prices from at least three parties as required by section 5.03 of the public finance regulations. In August 2012, Minivan News obtained the terms of reference document for the contract, which was signed by then-Deputy Attorney General, Aishath Bisham, who succeeded Aishath Azima Shukoor in April 2013. The leaked document also included a letter in Dhivehi sent from the Attorney General’s office to Finance Minister Abdulla Jihad requesting authorisation for Baroness Scotland’s “unprecedented work/expense” following her visit to the Maldives. “There was no contract made. With this letter we ask if attached terms of reference are sufficient as a contract,” the AGO wrote. Following media reports in the UK, then-Attorney General Azima insisted that the expenses for Baroness Scotland were made out of the proper budget code with approval from the finance ministry. Baroness Scotland came under fire in the UK press after the story emerged in the Daily Mail. The Mail established that the peer and former Attorney General had not listed the payment from the Maldives on the House of Lords’ register of members’ interests. “Her entry says she has set up a firm to provide ‘private consultancy services’ but says it is ‘not trading at present’,” the Daily Mail reported. “I am a senior barrister with specific expertise in the area of constitutional law, criminal and civil law reform, and am skilled in mediation,” she explained. Baroness Scotland was previously scrutinised by the UK press in 2009 after she was found to have been employing an illegal immigrant as a housekeeper in her London home. As the story emerged, MPs from the UK’s Conservative Party – which has long backed Nasheed and the Maldivian Democratic Party (MDP) – seized the opportunity to attack the former UK Labour Party Cabinet Minister. Conservative MP John Glen told the paper that Baroness Scotland should “hang her head in shame”. “To think that someone of her calibre would undertake an assignment to check if Foreign Ministers of Australia, Canada, Bangladesh, Jamaica, and others of CMAG had acted against their mandate is disgraceful,” Dr Faizal said. Oh man, She should use that money for dental work and plastic surgery. Why is Dhivehistan asking help from an unveiled mentally-deficient infidel who supports gay rights? Can't they just ask a Saudi mullah to issue a fatwa saying CMAG is haraam? Dhivehistanis would find that more convincing. I call upon Adhaalath and the Fiqh Academy to condemn Dhivehistan seeking help from kaafir homo-supporters. What happened to al wala wal baraa? But you have to admit that's its rather clever of Waheed to get a British AG embroiled into the coup scandal. Shows what. Brits could for money. If you properly investigate who was providing local legal assistance and correspondence for the Baroness the picture becomes clear. It was a payout to a known associate of Azima Shakoor! this is crime in day light. If you do a calculation of legal fees per hour rate, the figures comes way above even the highest paid lawyers in the US. Blood money! What a stupid woman. Does she realise the history of dmocracy in this country. Pure greed and bribery. Disgusting woman!